I was not planning to have a post on how to cut the vegetables for a sadya, but then when I thought about it, it seemed a good thing to do. 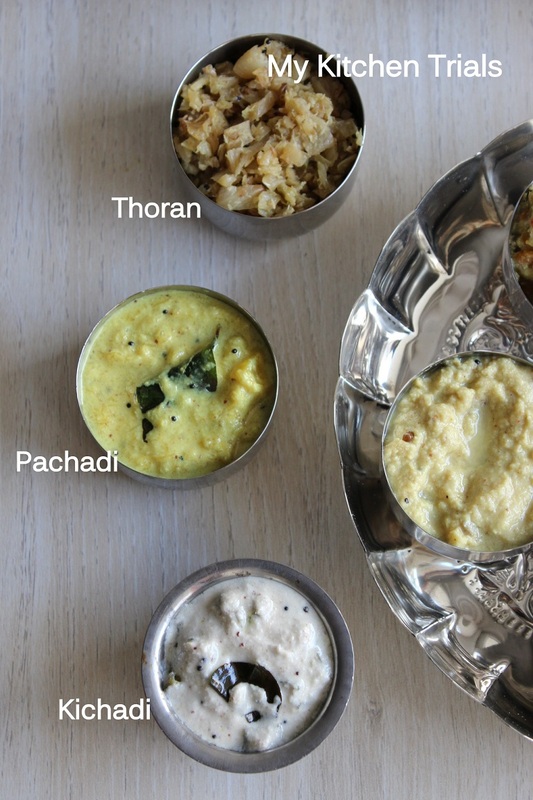 So, I discarded my original plan of making both Vendakka Kichadi and Vellarikka Kichadi for V.
By now, you must know that they are too many dishes for a Sadya and some of them are done in a particular way. We can change it a little bit to suit our convenience of course, but not so much that the dish is not recognizable . An avial cannot be called an avial if the vegetables are not cut into long finger chips like pieces as shown in the first picture. For avial, you can use many varieties of vegetables – in fact its a mash up of leftover vegetables cooked together, but English vegetables other than beans and carrots are not used much. The one I made above is a mix of cucumber, carrots, beans, yam, raw banana, ash gourd, snake gourd. The veggies are cut into finger chips shape of the same height and thickness. This helps in uniform cooking of the vegetables. 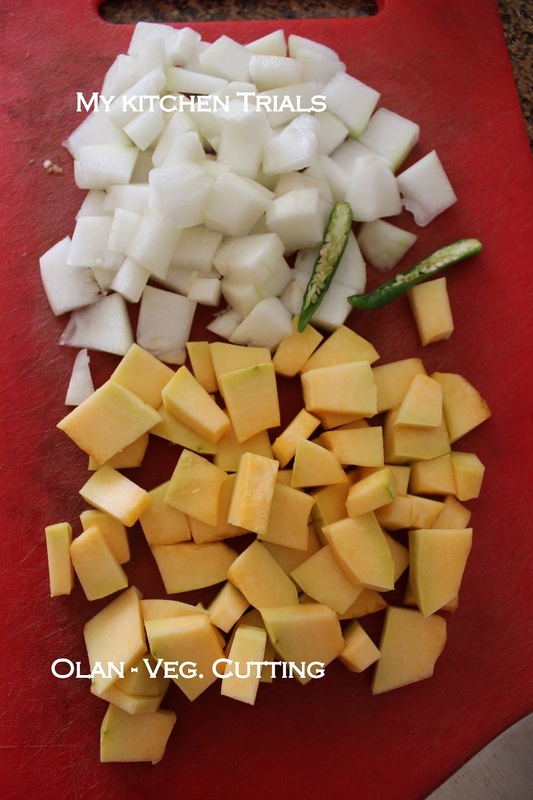 For Olan, you need to cut the vegetables like this. Big dices. Some people use only ash gourd, but a mix of ash gourd and pumpkin is also fine. You slice the chillies vertically into two and cook along with the vegetables. This size is fine for Erisseri, Koottu curry, mathan pachadi as well. 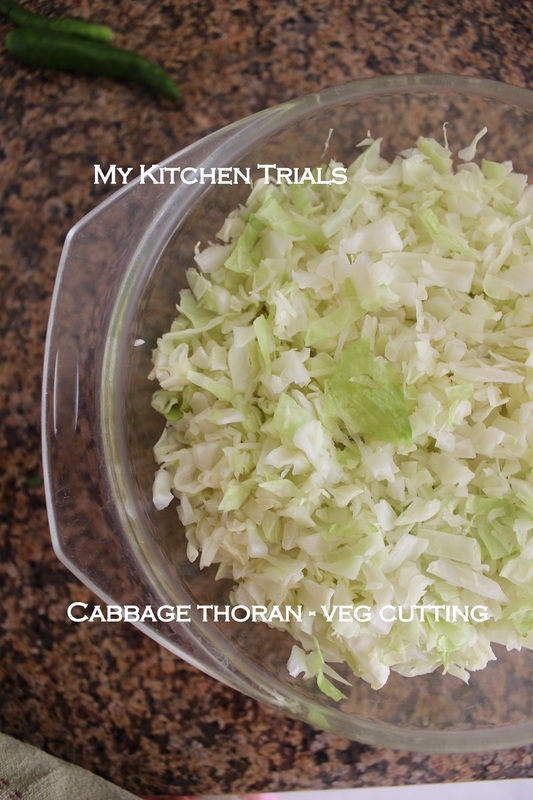 For cabbage thoran, the vegetable needs to be chopped fine. This is a personal preference as some people prefer it a bit bigger and some like it more finely chopped. 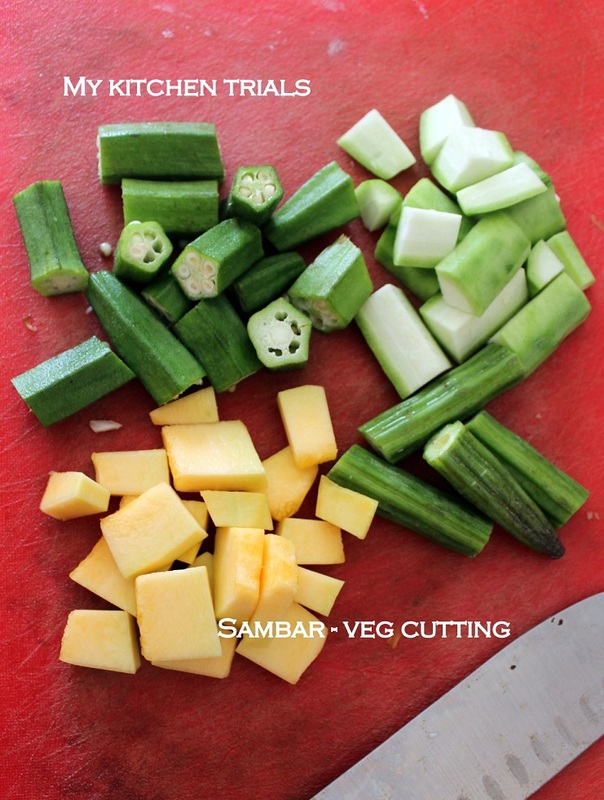 For sambar, the vegetables are again cut into big pieces. The pumpkin pieces could have been bigger, I wasn’t paying attention! This is for the recipe of the day. Vendakka Kichadi. Ladies finger is sliced very thin for this recipe. If you are using cucumber, it needs to be grated or ground with coconut into a paste. Finely slice the okra. Transfer it into a MW proof bowl. Add one tsp of oil, mix. Microwave for 6 minutes on high. It should be cooked completely and then should start to become a bit crisp. Cook in 1- 2 minutes intervals until the vegetable begins to get crispy. This can be done in stovetop as well. Grind the coconut, mustard seeds and chillies into a smooth paste. You can add a little water to get it going. Mix this coconut mix to yogurt, add salt and keep aside. This needs to be mixed to the okra at the time of serving only. Else the vegetable will become soggy. At the time of serving, heat oil for tadka. Add mustard seeds, chili and curry leaves one after the other. Add this to the vegetable. Mix the yogurt mix, taste test and adjust seasonings. Serve as a side dish to rice. Linking this to Valli’s Side Dish Mela. 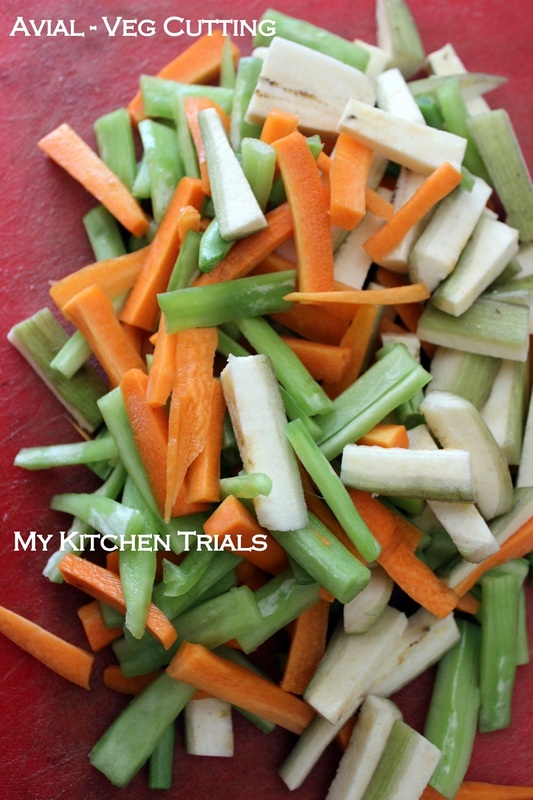 We only do like this, for every recipe we have a particular vegetable cuttings,still i remember how my mom scolded me when i chopped onions super finely for briyani instead of slicing lengthwise.. Ya I guess it is important to cut veggies Ina particular manner for a particular dish..I am specially particular when it comes to salads…..the taste of the dish changes..strange isn’t it? Like the bindi recipe. Such a vibrant post .. I love chopping veggies more than anything else in the kitchen , but grating coconuts is a bore :(( wonder how keralites grate so much coconut..
Wow hats off to you to think of such a post!! 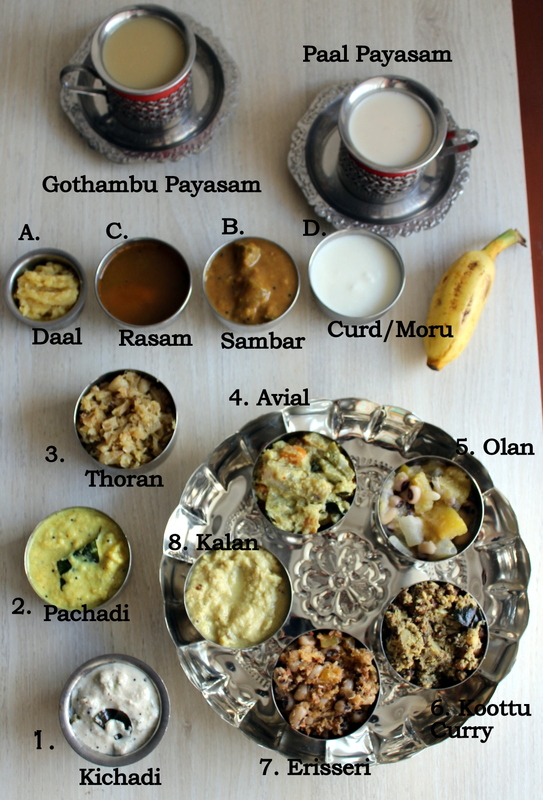 First when I started reading, I was thinking – how many varieties is she going to tell… but then you perfectly brought out the differences in cutting for each variety.. Love this..
And this vendaikkai pachadi is delicious!! Well even I am so finicky about this and when I had done a post on different ways to chop Onions, I was surprised on the mixed reactions..:)..guess I too learnt this observing my mom. I sometimes wonder why this is never told as a basic thing..As Vaishali says, I too feel the taste changes…lol…such a brilliant idea on the name..:)..I was so eager looking forward to the christening you would do for the last few letters..great job! My sister’s family is so particular about the cutting of vegetables and each dish needs a different size and shape of the vegetables.good one. This is very neat and wonderful post . My mother in law is very peculiar about shapes and when I shared this post with her she is so happy to see the veggies shapes and praised you ! Oh I remember my mother telling me learn to cut the veggies right way for this and that. It has to be just so. Your post is amazing. Vibrant colours of all the vegetables. Beautiful photographs. OMG, that last click literally took my breathe away — so many dishes — wow.. Very interesting post on vegetable cutting — good information. Lovely clicks. 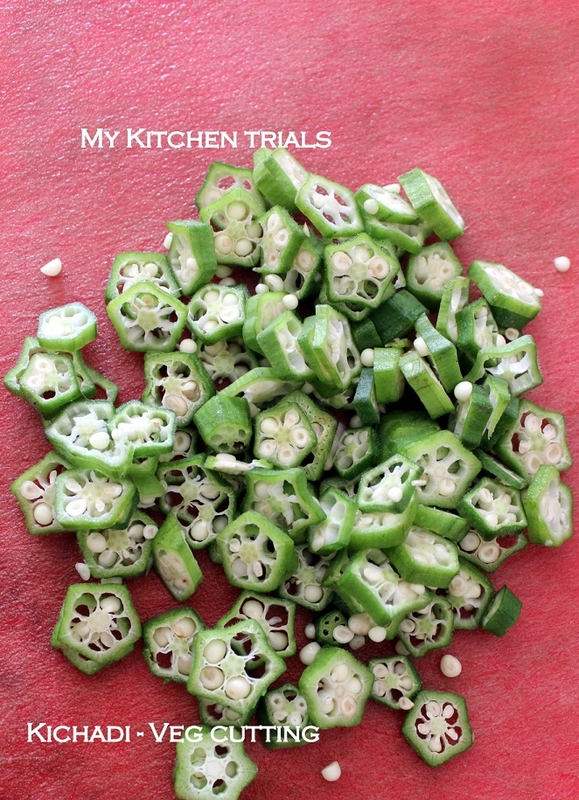 Okra kichadi sounds yumm!